Our average interaction rates are up to 2.6 million people per week and some posts reach over 12 million people. 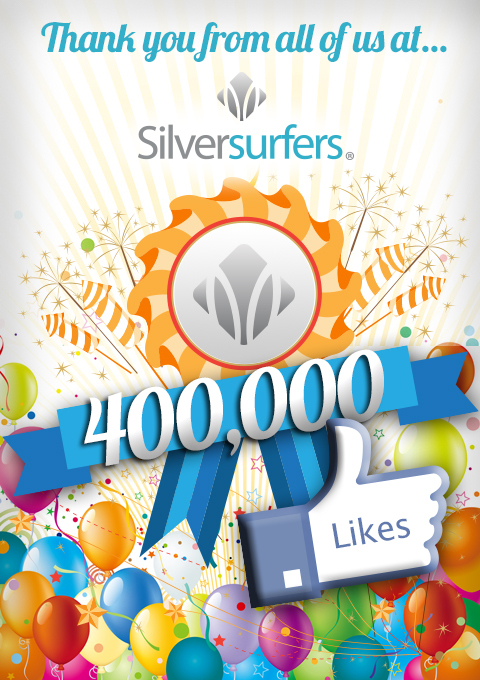 London, UK - 15th February 2017 the Silversurfers.com Facebook community achieved the major milestone of 400,000 “Likes” today. Creative Director, Sally Lock, who manages all social media activity said: “We have built a strong community on Silversurfers.com and the fun and interactions we have on Facebook is one of the key elements contributing to our success. Our average interaction rates are up to 2.6 million people per week and some posts reach over 12 million people. Facebook enables us to provide an integrated social experience for users who want to meet new friends, connect with old friends and share information online. Sally Lock and her team have created a safe and engaging social media environment where the over 50s debate, comment and interact on a wide range of topics. Some Silversurfers Facebook posts have also had up to 25,000 individual comments from our members. With over 6 million over 50s having a Facebook account, social media is being very widely used by this age group. This press release was distributed by ResponseSource Press Release Wire on behalf of Silversurfers.com in the following categories: Men's Interest, Women's Interest & Beauty, for more information visit https://pressreleasewire.responsesource.com/about.